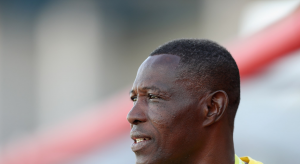 Ghana’s Under-17 female team coach Augustine Evans Adotey was left ‘overjoyed’ by his side’s 2-1 comeback stunner against USA at the ongoing FIFA Women’s World Cup in Jordan on Tuesday. The Black Maidens rallied from a goal down to stun the Americans in Amman. Frankie Tagliaferri opened the scoring for the Americans with a precise low shot in off the inside of the far post as early as the 5th minutes. But the West Africans responded with Gifty Acheampong heading in the equalizer before captain Sandra Acheampong scored the decisive goal through the spot kick six minutes from time. And coach Augustine Adotey, whose side endured a rather difficult preparations prior to the tournament, was left thrilled. “It’s all joy. Because going down 5-0 against Japan the other time meant a defeat or draw could have kicked Ghana out,” he said at the post match conference. “Winning 2-1 today gives me faith that maybe we can move to the next round. “We came here with an aim. In 2012 in Azerbaijan, we won the bronze medal. The last time out we got to the quarter-final stage. So we set a target of going beyond what we achieved in 2012. The Black Maidens will take on Paraguay in their final group D game on Friday where a win will ensure their progression into the next stage.